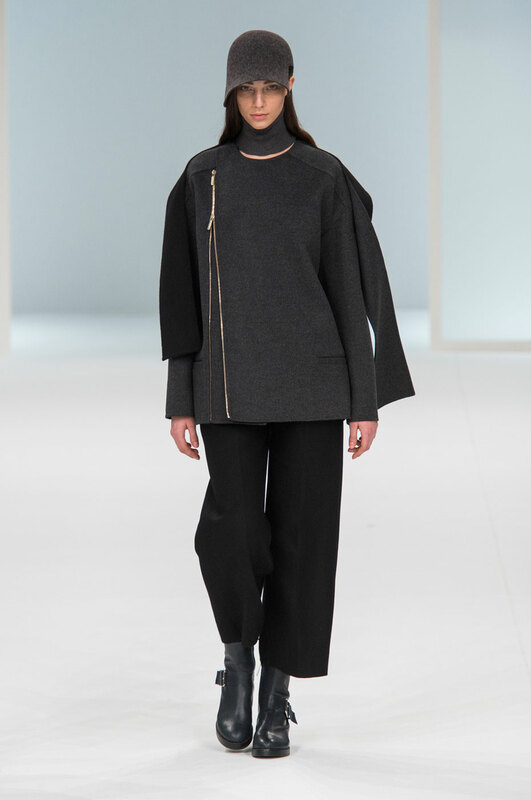 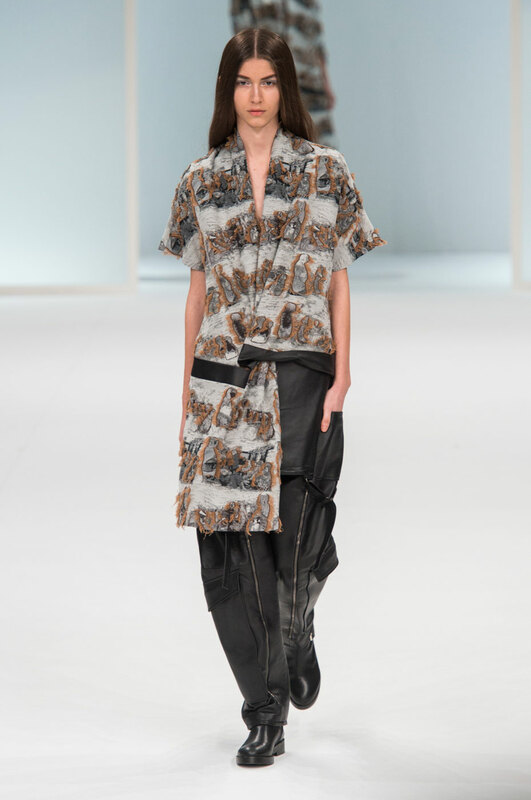 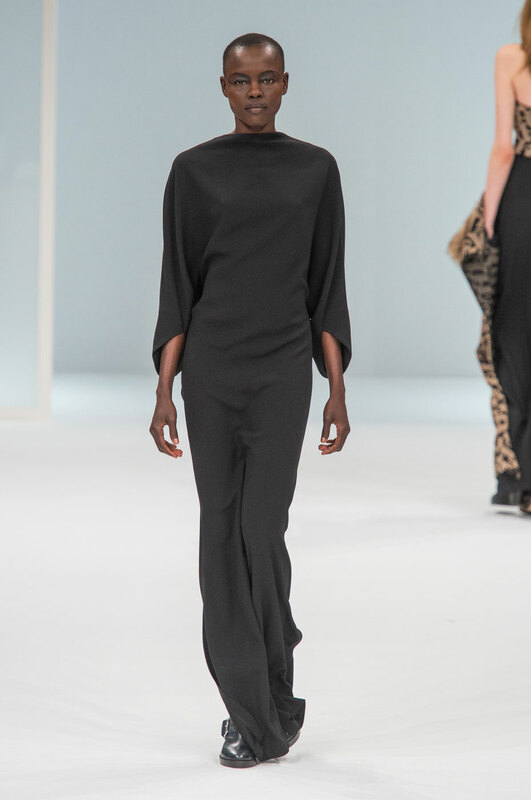 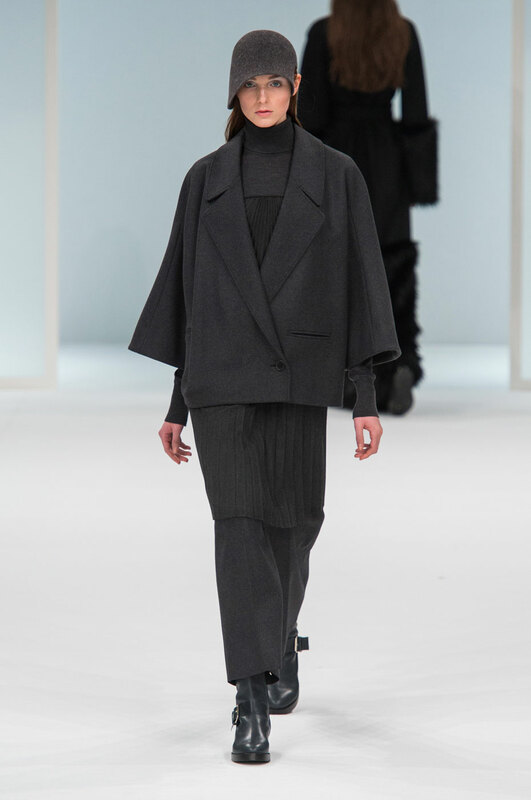 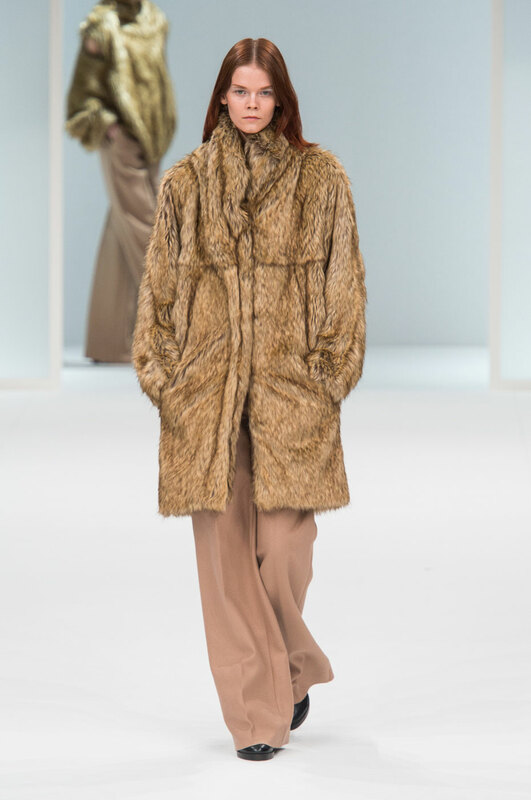 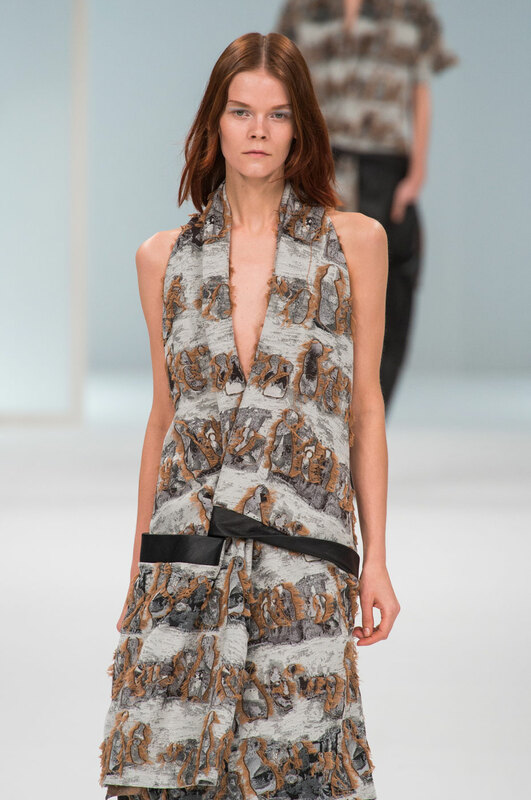 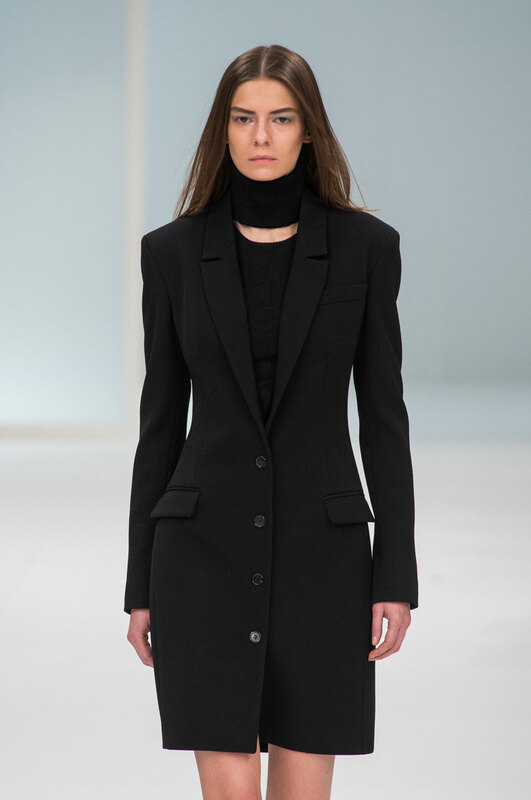 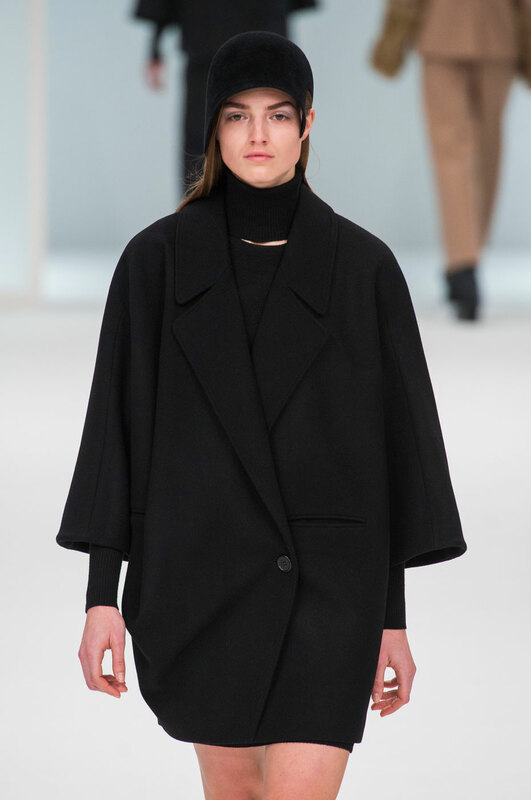 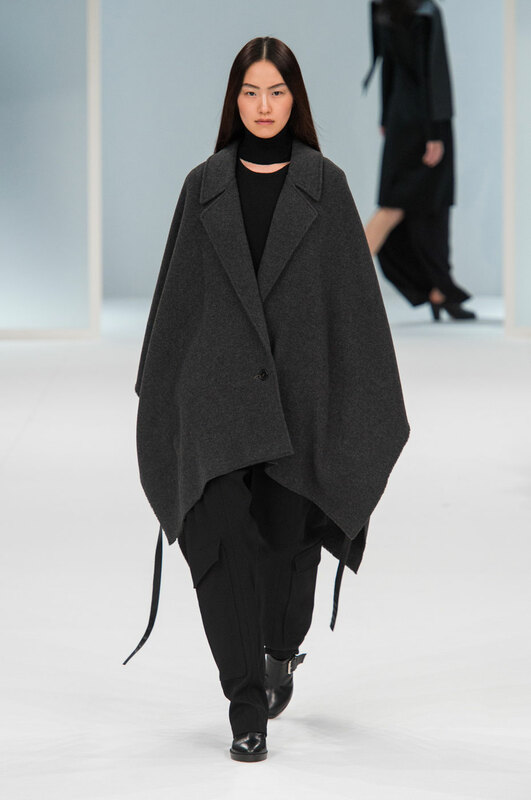 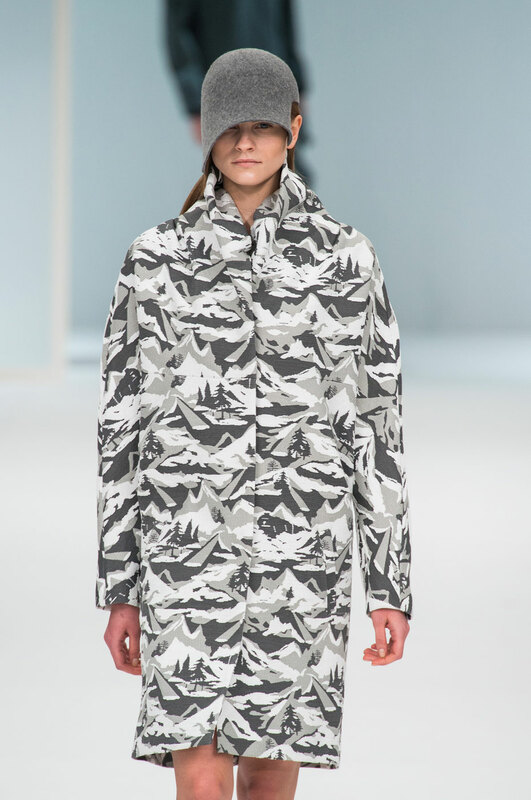 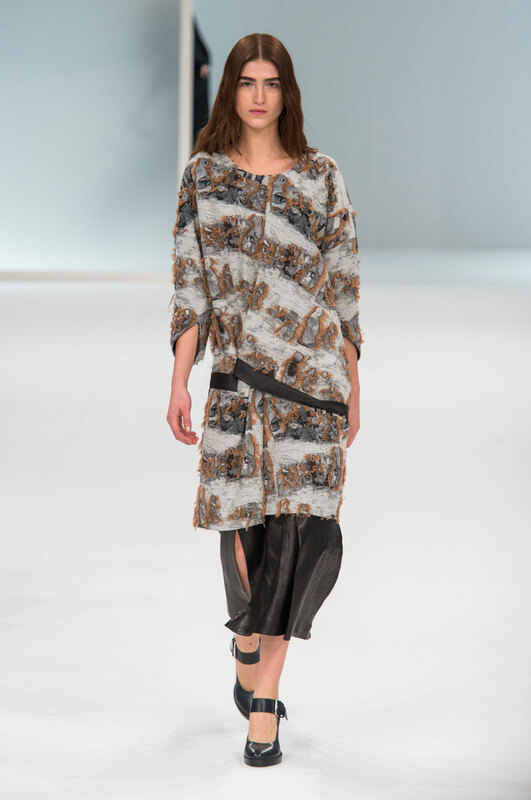 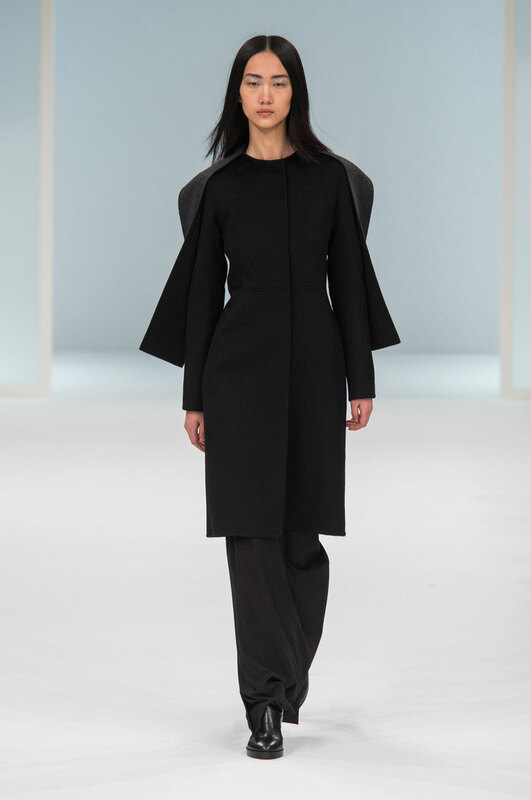 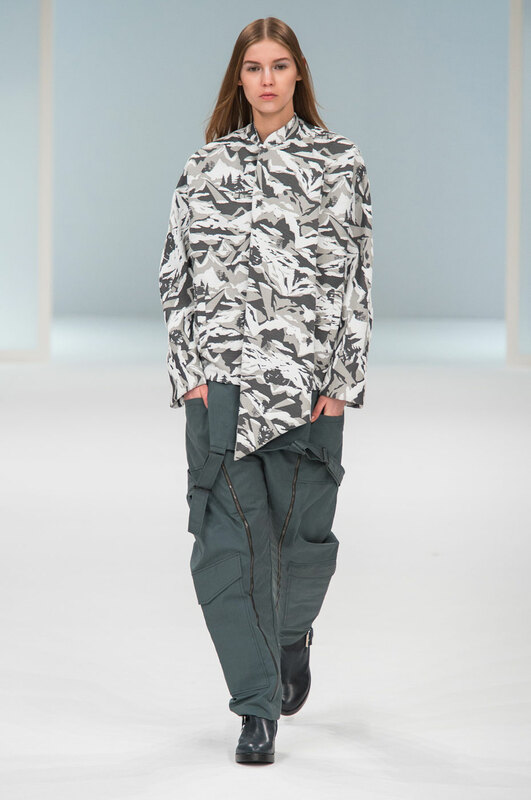 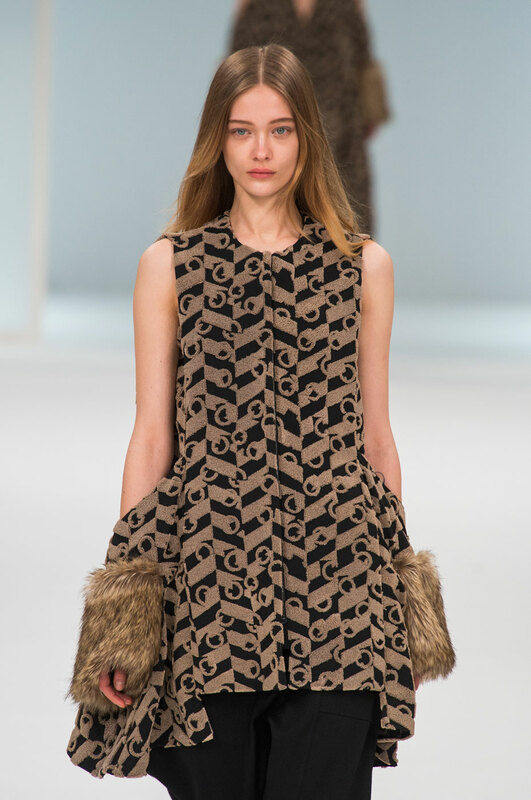 Chalayan Women Autumn-Winter 2015 – Hussein Chalayan bound the Oriental Express train once again, continuing his journey from where he left off in his Pre Fall collection. 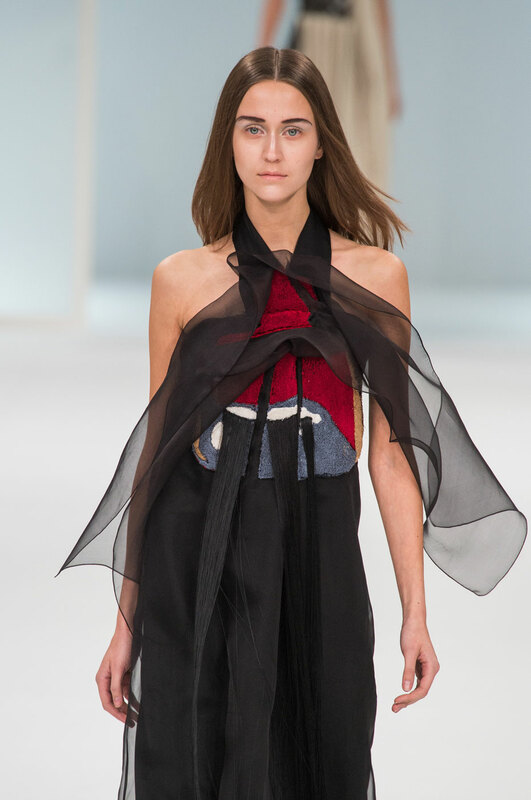 The 1974 novel Murder on the Oriental Express written by Agatha Christie was an inspiration for the collection but rather than offer a literal interpretation, Chalayan abstracted ideas and applied them to his signature draped-and-folded silhouettes. 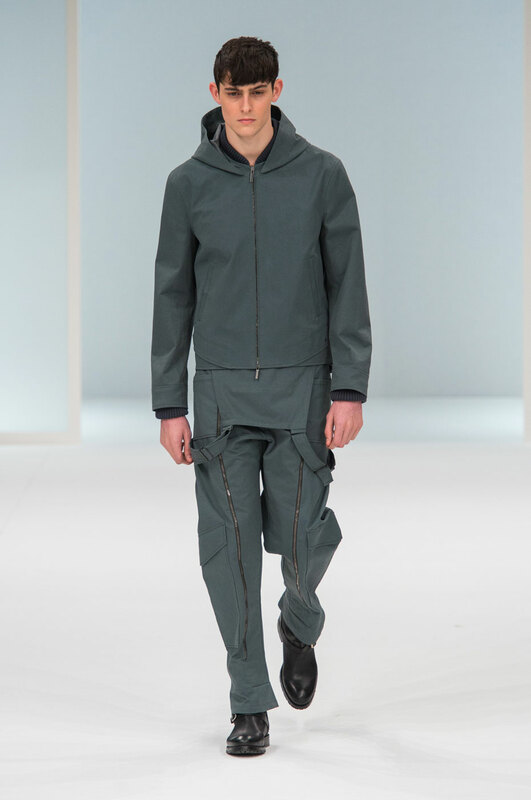 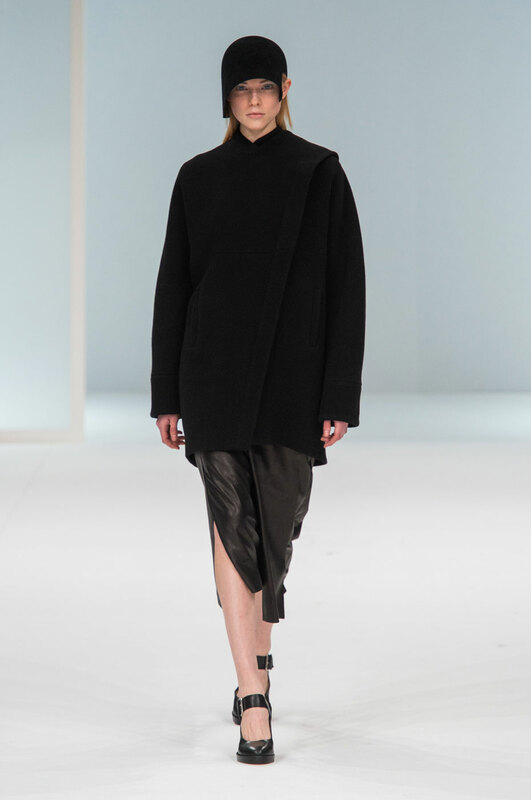 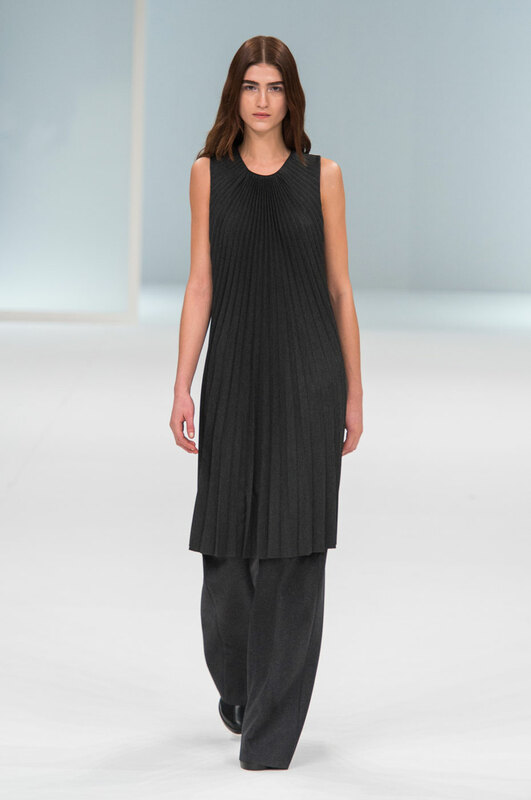 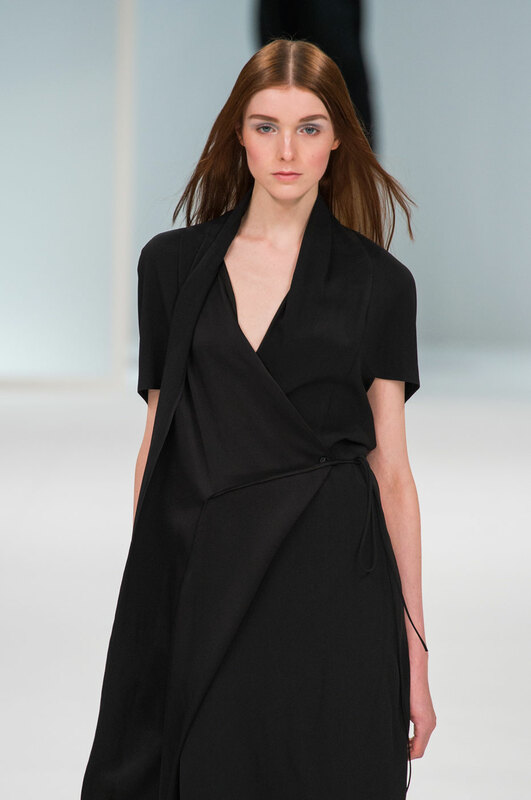 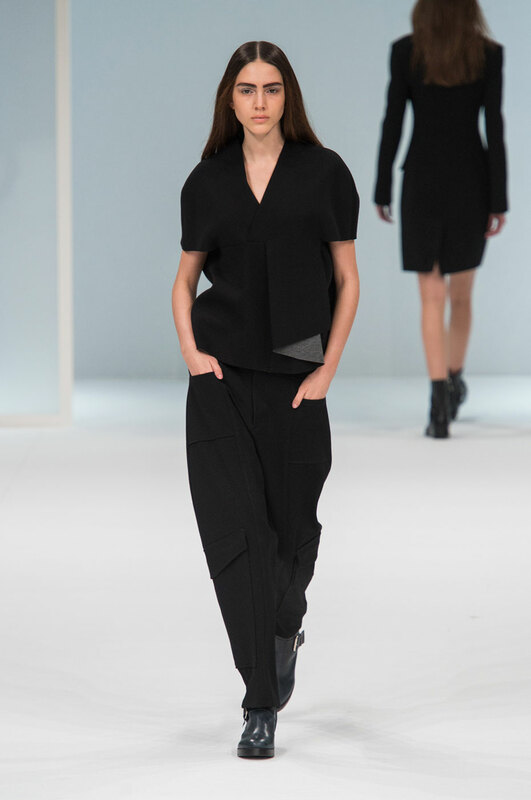 We have become accustomed to Chalayan’s abstract inspirations. 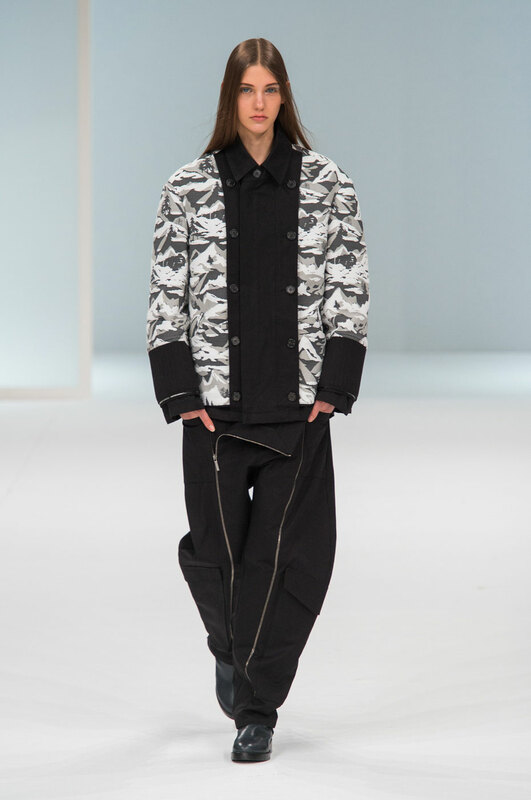 Grey and white jacquard print, inspired by the headlights of a train stuck in a snowstorm made reappearance, this time on a bomber jacket, cocoon- style coat and an oversized shirt. 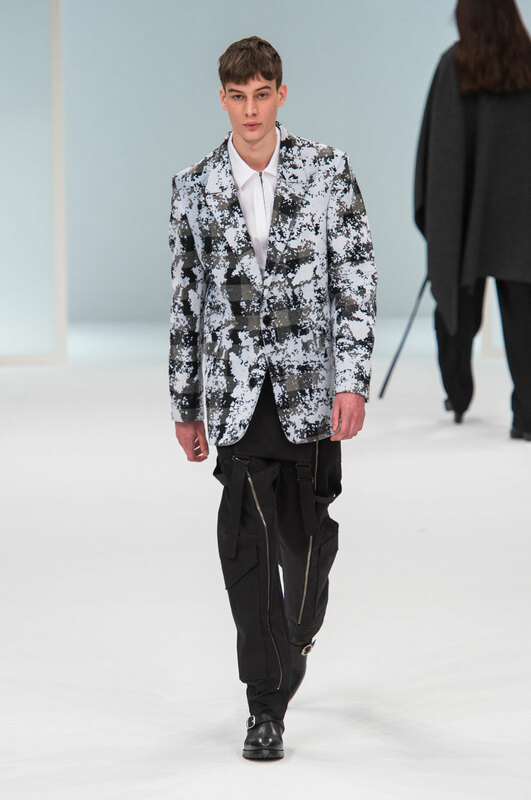 Pixilated monochrome camo printed blazers paired with utilitarian work-wear trousers. 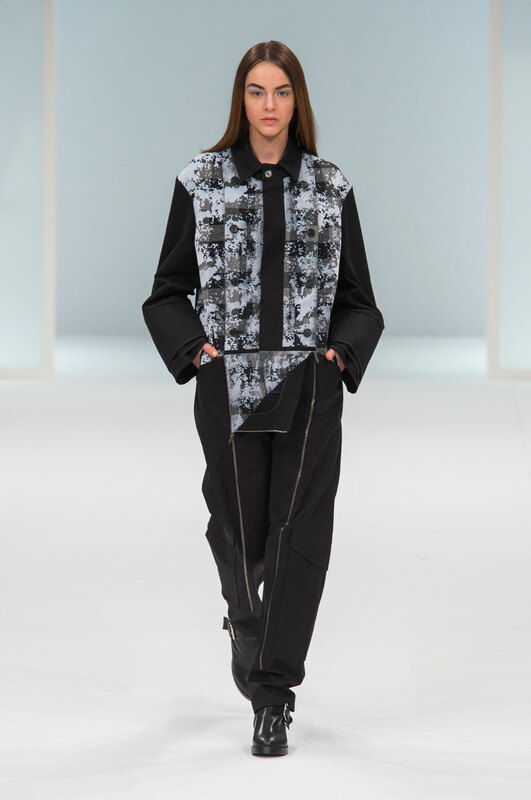 Colour palette was kept simple with hues of black, grey, white and blue. 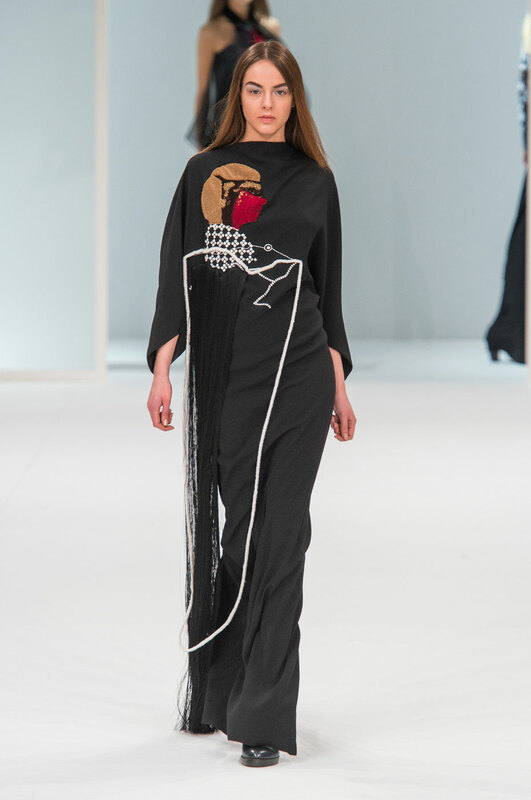 Visual elements he managed to extract from the movie: Suspect characters (a lady knitting) emblazoned on black floor-sweeping gowns with fringing detail. 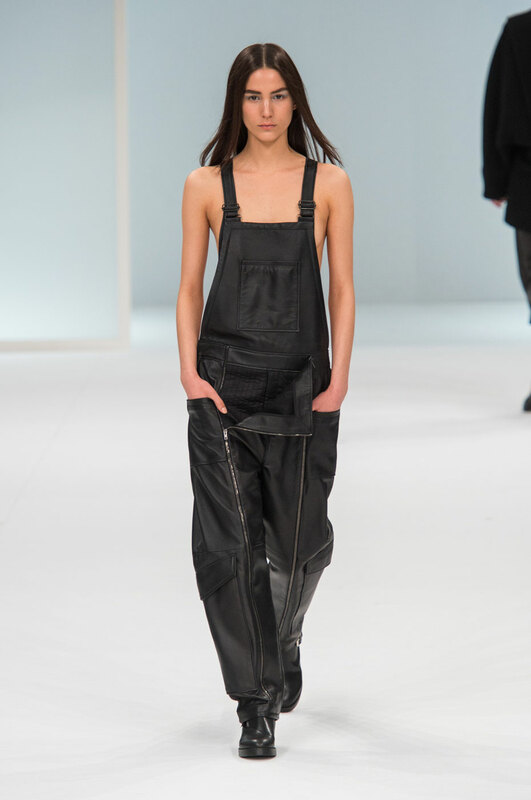 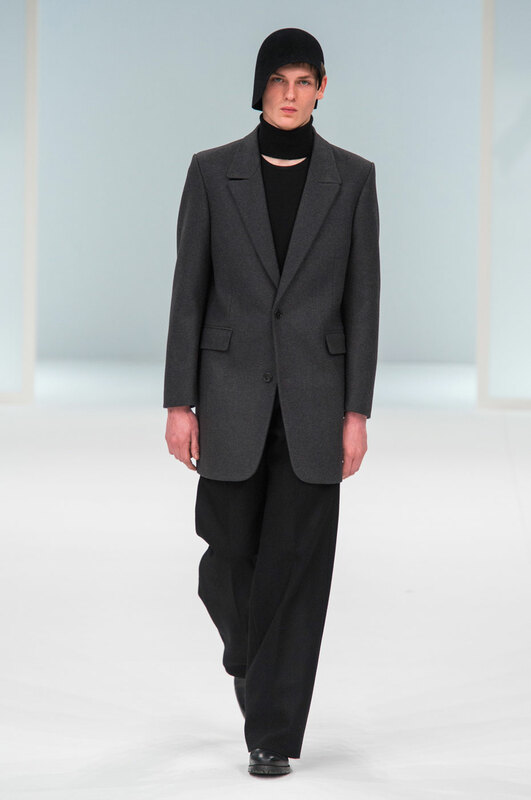 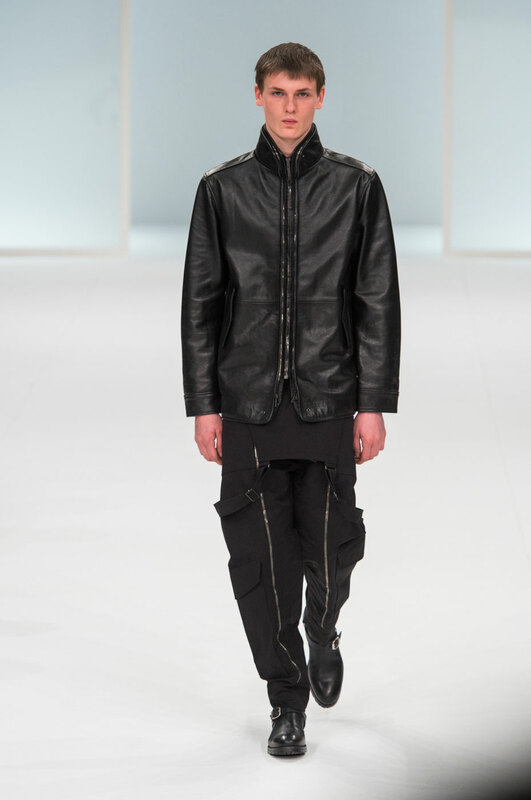 Black and grey clean lined tailoring to articulated metallic and rough-hewn textures were featured as was leather dungarees worn over a bare chest. 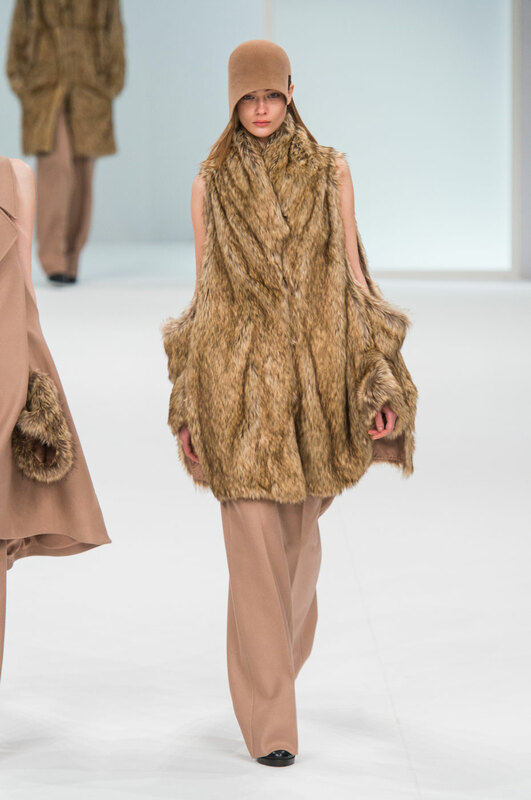 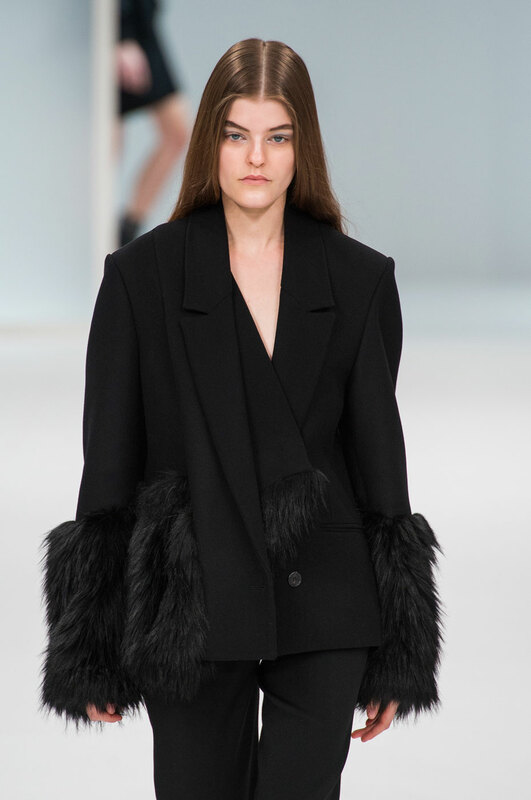 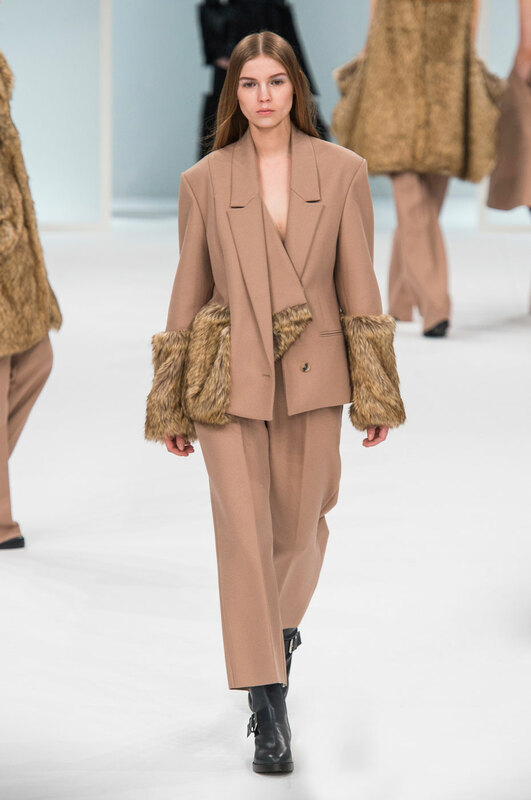 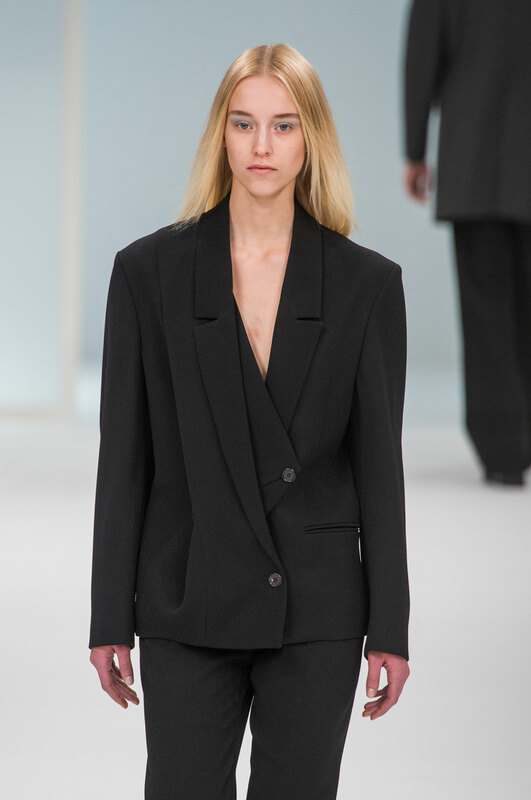 Shoulders were exposed as Chalayan used his renowned draping style to accentuate the arms of blazers and tops which were cuffed with fur. 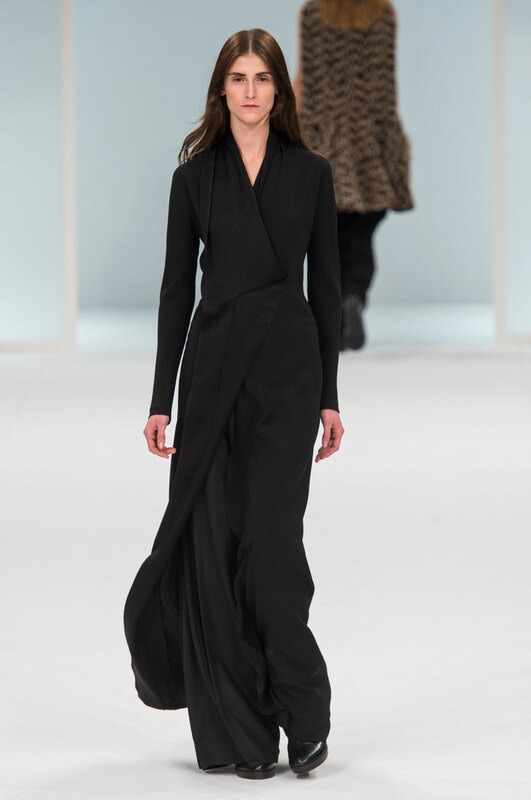 The sleek, sculptural quality that is a house signature was achieved here with the evening wear that closed the show. 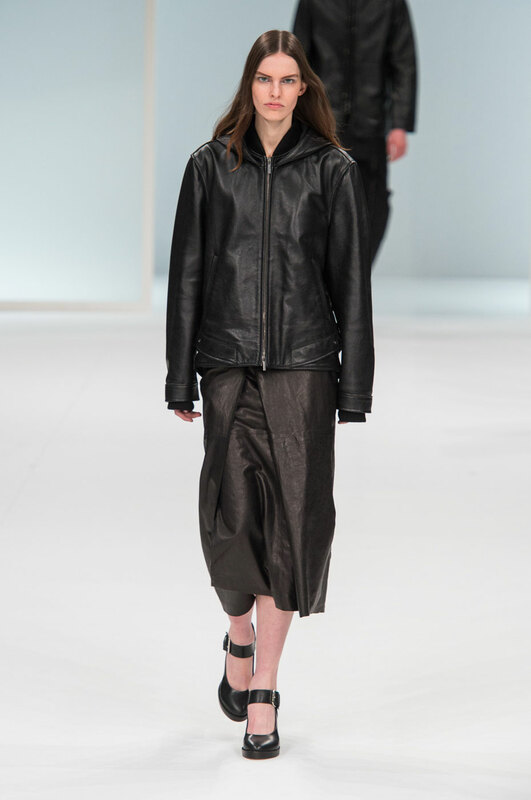 Foiling, ball-bearings suspending pleats (which hung like a curtain) created futuristic chic. 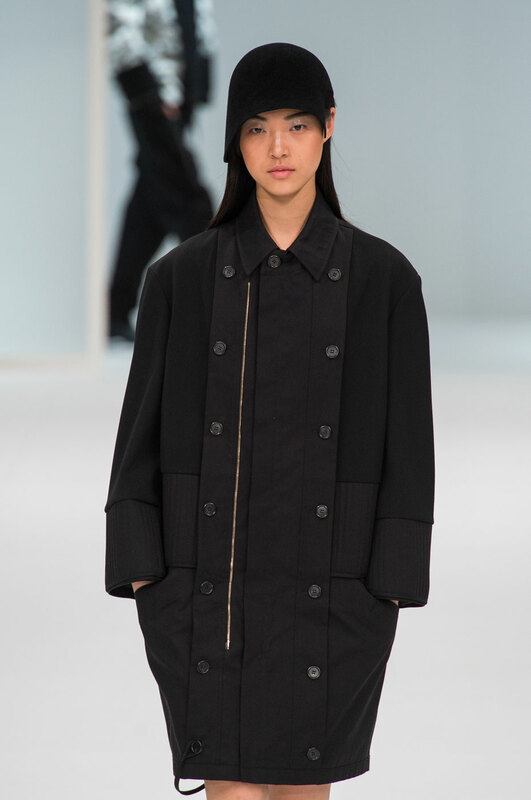 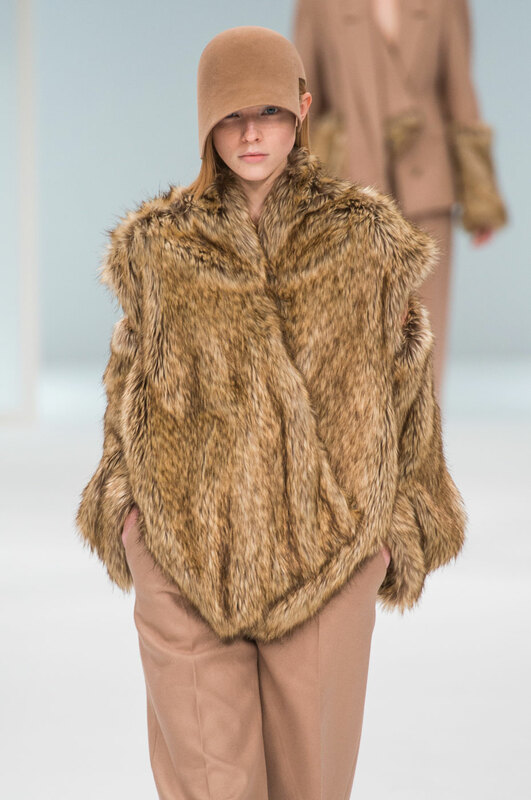 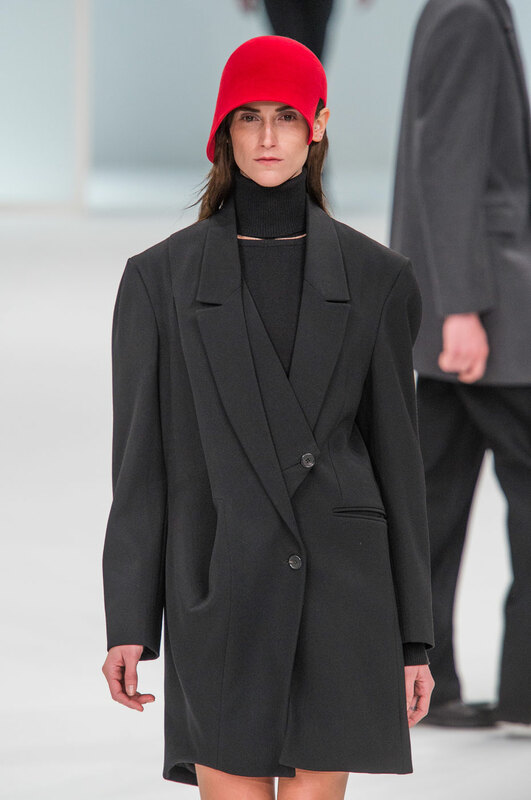 Models walked down the catwalk in black boots which toughened up the look and structural asymmetric cloche hats. 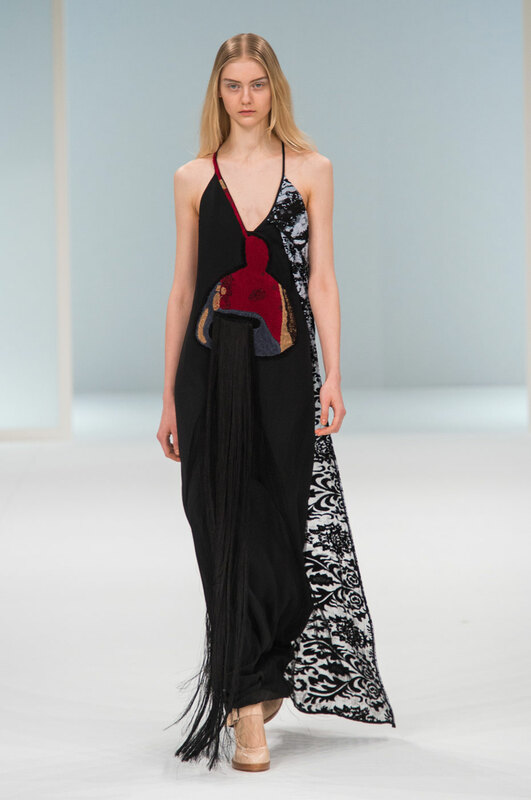 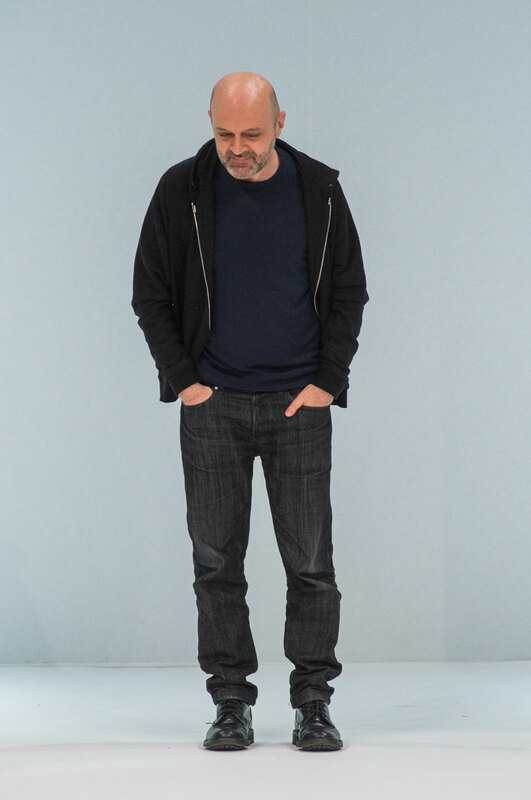 A creative modernist version of Murder on the Orient Express as told by Hussein Chalayan.